Lightroom Classic Tutorials > Keyboard Shortcuts > How do I change or create keyboard shortcuts? 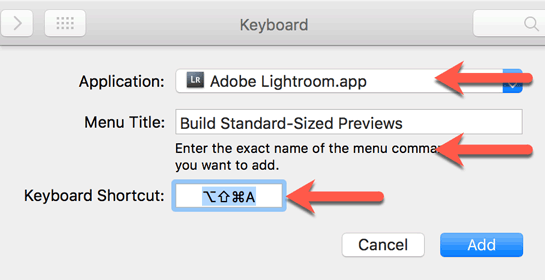 If you’re using the English version of Lightroom with another language keyboard, some of the keyboard shortcuts might not work. On a Mac, the easiest way to change a keyboard shortcut is to use the operating system keyboard preferences. In Lightroom, make a note of the menu command, being careful to note any punctuation too. Go to Applications > System Preferences. Open the Keyboard preferences and select the Shortcuts tab. Select App Shortcuts and click the + button. Select Lightroom in the Application pop-up. If it doesn’t show up, scroll down to the bottom, select Other and navigate to Applications > Adobe Lightroom > Adobe Lightroom.app. In the Menu Title field, type the menu command, for example, Build Standard-Sized Previews. You must type the command exactly as it appears in the menu, including ellipses (such as Synchronize Folder…) and any other punctuation. To type an ellipsis, use three periods without spaces. 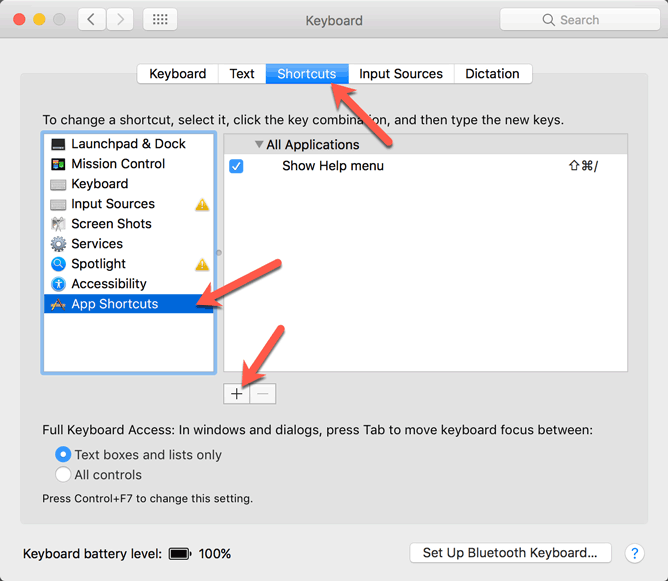 Click the Keyboard Shortcut field and tap your keyboard shortcut, holding down Cmd, Opt and/or Shift as needed. Repeat steps 4-8 for any additional shortcuts. If you’re on Windows, there isn’t a user interface for changing shortcuts, but it’s possible to edit Lightroom’s TranslatedStrings file. This file is designed for language localizations, but can be edited to change various user interface elements including keyboard shortcuts. This isn’t officially supported by Adobe, but works reliably. If you run into problems, you can simply delete the file (or restore a backup), so it’s relatively risk-free. In another text editor window, open the TranslatedStrings file for another language, for example, TranslatedStrings_Lr_es_ES.txt from the es or es.lproj folder. The file is long and includes translations as well as shortcuts, so you’ll probably need to use your text editor’s search function to find the shortcut that you need to change. Copy your chosen line into the TranslatedStrings_Lr_en_US.txt and edit the shortcut after the = sign. For example, to change the Decrease Rating shortcut from a to ; you’d find the line that says “$$$/LibraryMenus/MenuShortcut/DecreaseRating=a” and change it to “$$$/LibraryMenus/MenuShortcut/DecreaseRating=;”. Save the file, and keep a copy somewhere else too, as it may be replaced when you update Lightroom. Restart Lightroom. If it doesn’t seem to work, check for curly quotes (“ ”) and replace them with straight quotes (” “), and ensure there are no blank lines at the end of the file. If you’re using Lightroom in another language, the principle is exactly the same, but the TranslatedStrings file will already be in your language’s project folder (e.g. the ‘fr’ or ‘fr.lproj’ for French), and you’ll need to edit it, rather than creating a new file. If you’re editing an existing file, obviously back it up first! It’s possible to change the increments of the sliders with that ? Wonderful – your blog posts are, as always, very helpful. Thanks. I did figure out how to write my own presets for Lightroom, but they are very simple ones, but more complex ones require a fairly good knowledge of the code they are written in, which seems like too daunting a task for me and does not fit my time priorities, especially since I don’t know what the language is called in order to begin learning it. In any event, I know it is possible to create useful presets within Lightroom without actually writing the underlying code and have done that, of course. Thank you very much for your availability. I have never used Lightroom …. and I’m happy to receive these tips. Please keep doing. Everything is clearly explained. I’m Italian and I can follow you without problems by your books as well. I want to follow the other people in the forum and try to understand. It seems a very interesting software but also not so immediate …. Is there a simple way to assign a keyboard shortcut to open the File->Plug-In-Extras dropdown box? I use it a lot and I’m surprised there’s not already a shortcut to get to it. Nope, but if you’re on a Mac, you can create one in exactly the same way shown above. Or if you’re on Windows, Alt and the series of underlined letters will work. Is this unique to me, or do others see it too? 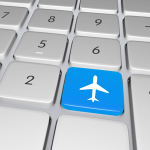 Is your TranslatedStrings trick likely to be able to overcome it? I haven’t tested that Andrew, but it’s worth a shot. I need some help on this …. But just this last week I’ve got a brand new computer and during the weekend have installed all the software I use from scratch, which is great – new, fast computer with fresh OS and freshly installed software. WOW! It’s quick! And I was looking forward to editing some photos in Lightroom but that soon turned into frustration …. I’ve copied the files over from my old computer to the new one. And I’ve tried creating new files, but it Lightroom just keeps ignoring the translated strings files. Lightroom has no problem with my other settings and presets that I copied over from my old computer – just translated strings. I’ve tried googling this but I haven’t managed to find any further information. Have they changed it again so the english version of translated strings is not read at all? Or is there some other trick that I need to do to get this working again. The instructions above were confirmed working on 2015.9, so check you are definitely updated, as they don’t work in earlier versions. Beyond that, what OS version are you using? And which LR version? Have you tried following the instructions above to the letter, before trying your own file? A little more info. …..
On a Windows 7 machine I’ve been using Lr since Lr 4, upgraded to Lr 5 and Lr CC version, keeping both OS and Lr update along the way. At some point my old machine was upgraded to Windows 10. My new machine is Windows 10, fresh install and all updates applied.. In fact everything is freshly installed. So far, I’ve done everything like I used to on my old machine but Lr just seems to ignore the translated strings file. I even copied over the file from my old machine which is still working. So I know the file works. I just don’t know why Lr wont read it. What kind of changes were you making in the file Ben? I did test on Windows 10 when I wrote these instructions, so it’s possible there’s a new bug in 2015.10.1, or it’s possible there’s some other kind of problem. I will test on my Windows 10 VM when I’m back at my desktop, but that won’t be for a couple of days, which is why I’m asking about starting from scratch using the instructions above rather than copying the file or its contents from the other machine. I didn’t mention it earlier, but I had actually already tried creating a new translated strings from scratch, even though I can’t see why that would make any difference as it’s just text file. It didn’t help the cause, BTW. Though, I now have Lr reading translated strings on my new machine. I had asked about this problem in the Adobe forums too, and when I was writing a post there I suddenly thought of something ….. I know that when Lr is set to use another language other than English it uses Translated Strings for that respective language to configure Lr. So as a test I went in to Lr preferences and changed the language to Swedish, restarted Lr and it was in Swedish. So that proved Lr was in fact still capable of reading Translated Strings files. I even tried put in a line from my English Translated Strings file and it worked. I then changed Lr back to English and when I restarted it again it was for some reason reading TranslatedStrings_Lr_en_US.txt as my settings were applied and everything was as it was supposed to be. I’m happy it’s working but …. What’s up with that??? Very weird… but I’m really pleased it worked! Thanks for the update. Ben, thank you. Just ran into this with one of my laptops. Turns out in LR Preferences I had the language setting dropdown as BLANK. After I changed it to English all works again. Thank you. And thank you for taking time to answer. BTW, since we’re on the topic of translated strings, do you know of some sort of list or source of strings or cool tricks that one can use in the translated strings file? Obviously you can pick what you want from the other languages translated strings files like you have in your post here on this page. I was thinking of things that aren’t obvious. For example, in my translated strings I had to create a line that let Lr copy files into a specific folder hierarchy when importing files. I don’t know of a list specifically. There are a few tricks in Appendix A-22 to A-25 of my LRCC/6 book, but they’re generally undocumented. I use Lightroom with a Danish keyboard, so I need to edit some of the shortcuts in order to be able to use them. However, the second line made my new shortcut appear in the shortcut help "Ctrl-/", but this does not work any more. So my question is: Is there a new way to edit the shortcut help? I can’t find any such line in any of the TranslatedStrings files, so probably not, sorry. For the new Lightroom Classic CC, there are now language folders in the Resources folder. Simply place the translated strings file in your appropriate language folder and it will work as before. If you want to create custom keyboard shortcuts for any program including LightRoom Classic; purchase a Logitech G13 game pad keyboard. it is VERY easy to create any keystroke and you can save all your work and have the G13 auto load your custom keystroke every time you start your program. It is a real time saver. If you want to be able to record mouse movements and selections you can purchase a Corsair K95 RGB keyboard but programing this keyboard takes a little more work but has much more ability. The Logitech G13 has 22 keys each with three layers of programmability for a total of 66 separate custom key stroke combinations as well as a joystick with two more keys accessible to your thumb for additional functionality. The Corsair K95 has 18 separate customizable keys also with three layers of custom key stroke/mouse combinations for a total of 54 shortcuts and if you like, you can customize any key on the keyboard for special function/keystrokes. I have used both for years for everything from CAD software to word processors as well as games and LightRoom and Photoshop. Thanks for sharing Jack. Just in case anyone’s thinking of trying it, just bear in mind you can’t create keyboard shortcuts for Develop sliders. Apart from that, I’m sure it works brilliantly, but since it’s something people ask regularly, it’s worth noting! Hopefully Adobe will add the ability to assign keyboard shortcuts to sliders one day too. Victoria, thank you a million times! I’m new to mac and don’t have an Eng keyboard so I had no clue I could change the shortcut. May the universe bring you riches and wealth forever! I’ve installed the latest Classic CC 8.1, but the TranslatedStrings_Lr_en_Us.txt files causes Lightroom to crash. When I look in the Spanish version, I’m not seeing a Toggle5Shortcut. I’m seeing 1-4 (e..g “Toggle4Shortcut=9”) but not 5. Perhaps a clue? Hi, looks like just what I need to start and stop tethered capture with a keystroke. But I’m having no luck. Method 1, I executed ok, but it doesn’t work for me. I tried a number of different keys with no luck. I would have preferred Cmd-T to start, but it just toggled the toolbar. Yes, I am shutting down and restarting LR. Method 2, I’m not able to create the file, no permission. I verified I have an admin account, but no luck. Where is it locked out? What’s the menu command you’re trying to create a shortcut for Jim?